Even though I took this photograph of the hat in question, when I examined the image later it became ambiguous to my eyes. If I did not know it was a hat, I might mistake it for a black cabbage, a truffle, or an exotic dried fruit, or maybe even a specimen of a brain preserved in a medical museum. 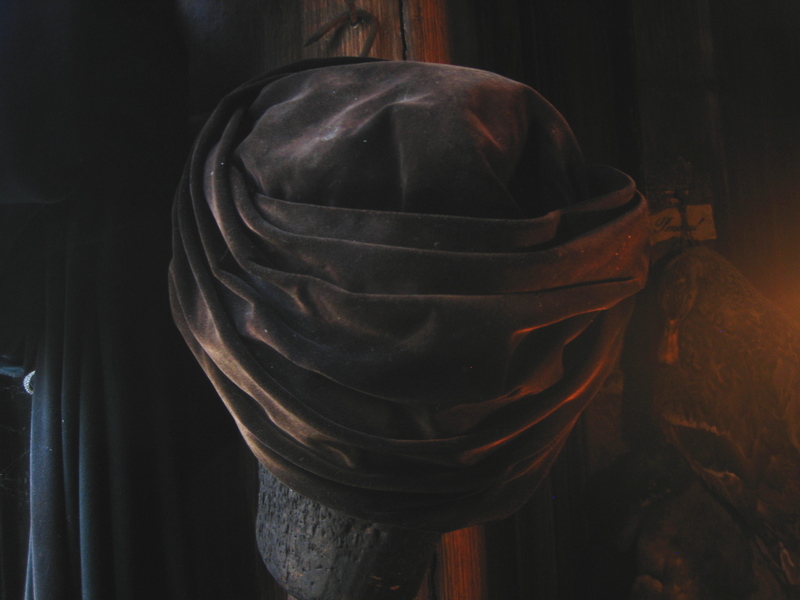 Did you notice this hat when you visited the Smoking Room at Dennis Severs’ House in Folgate St? You will be forgiven if you did not, because there is so much detail everywhere and, by candlelight, the hat’s faded velvet tones merge unobtrusively into the surroundings. It seems entirely natural to find this hat in the same room as the painting of the gambling scene from William Hogarth’s “The Rake’s Progress” because it is almost identical to the hat Hogarth wore in his famous self-portrait, of the style commonly worn by men in his era, when they were not bewigged. Yet, as with so much in this house of paradoxes, the hat is not what it appears to be upon first glance. If it even caught your eye at all because the gloom contrives to conjure virtual invisibility for this modest piece of headgear – if it even caught your eye, would you give it a second glance? It was Fay Cattini who brought me to Dennis Severs’ house in the search for Isabelle Barker’s hat. Fay and her husband Jim befriended the redoubtable Miss Barker, as an elderly spinster, in the last years of her life until her death in 2008 at the age of ninety-eight. To this day, Fay keeps a copy of Isabelle’s grandparents’ marriage certificate dated 14th June 1853. 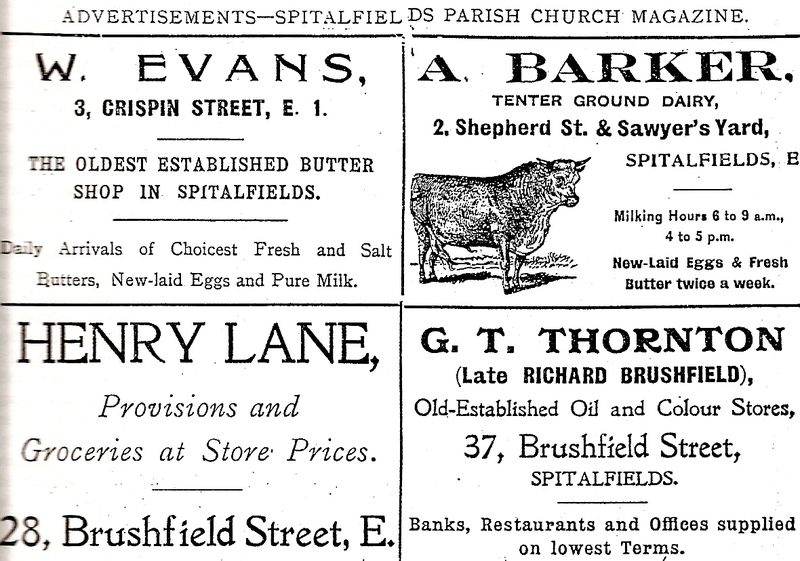 Daniel Barker was a milkman who lived with his wife Ann in Fieldgate St, Whitechapel and the next generation of the family ran Barker’s Dairy in Shepherd St (now Toynbee St), Spitalfields. Isabelle grew up there as one of three sisters before she moved to her flat in Barnet House round the corner in Bell Lane where she lived out her years – her whole life encompassing a century within a quarter-mile at the heart of Spitalfields. “I was born in Tenterground, known as the Dutch Tenter because there were so many Jews of Dutch origins living there. My family were Christians but we always got on so well with the Jews – wonderful people they were. We had a dairy. The cows came in by train from Essex to Liverpool St and we kept them while they were in milk. Then they went to the butchers. The children would buy a cake at Oswins the baker around the corner and then come and buy milk from us.” wrote Isabelle in the Friends of Christ Church magazine in 1996 when she was eighty-seven years old. 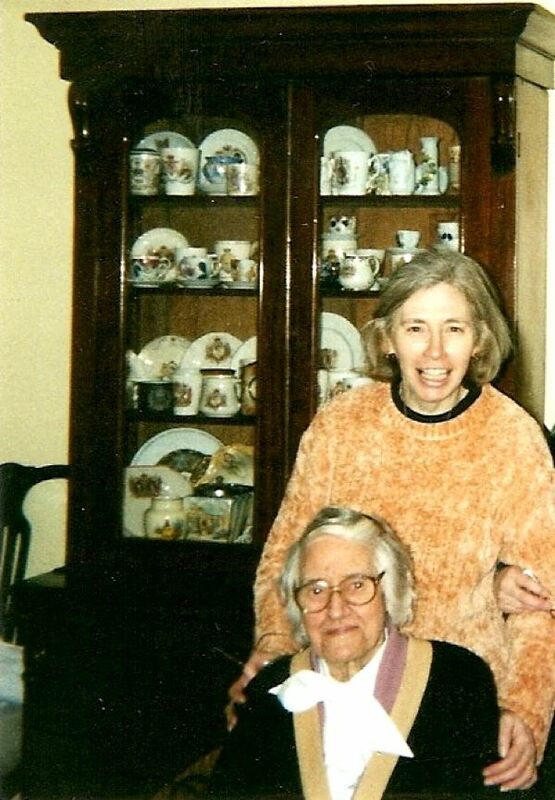 In fact, Fay remembered that Isobel gave her hat to Dennis Severs, who called her his “Queen Mother” in fond acknowledgement of her natural dignity, and he threw her an elaborate eightieth birthday party at his house in 1989. But although nothing ever gets thrown away at 18 Folgate St, when we asked curator David Milne about Isabelle Barker’s hat, he knew of no woman’s hat on the premises fitting the description – which was clear in Fay’s mind because Isabelle took great pride in her appearance and never went out without a hat, handbag and gloves. 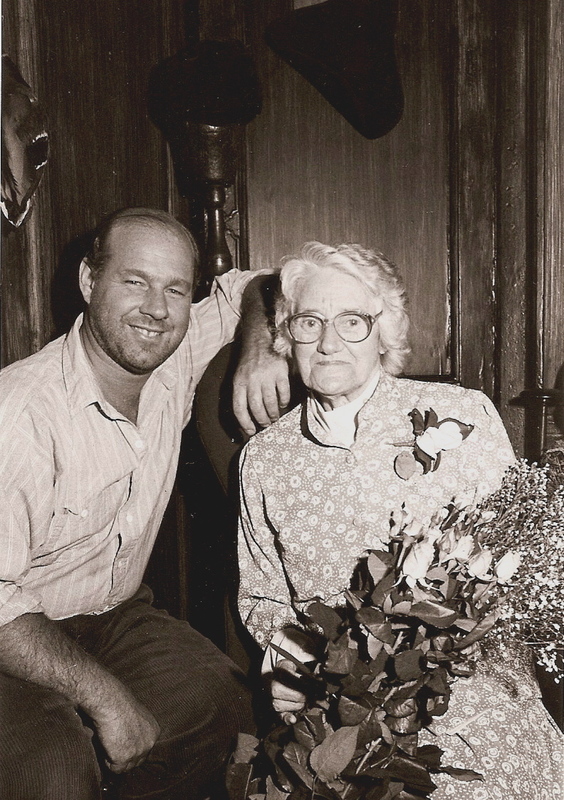 When Fay showed me the photo you see below, of Isabelle Barker with Dennis Severs at her eightieth birthday party, David realised at once which hat belonged to her. Even though it looks spectacularly undistinguished in this picture, David spotted the hat in the background of the photo on the stand in the corner of the Smoking Room – which explains why the photo was taken in this room which was otherwise an exclusive male enclave. 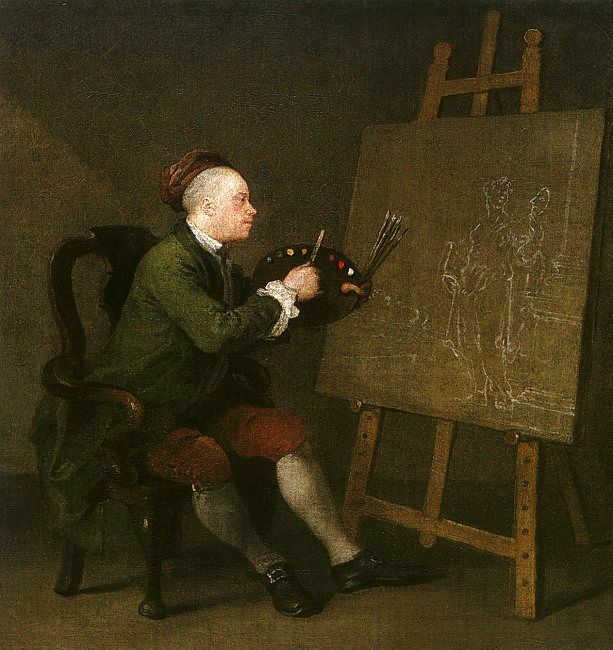 At once, David removed the hat from the stand in the Smoking Room where it sat all these years and confirmed that, although it is the perfect doppelganger of an eighteenth-century man’s hat, inside it has a tell-tale label from a mid-twentieth century producer of ladies’ hats. It was Isabelle Barker’s hat! The masquerade of Isabelle Barker’s hat fooled everyone for more than twenty years and, while we were triumphant to have discovered Isabelle’s hat and uncovered the visual pun that it manifests so successfully, we were also delighted to have stumbled upon an unlikely yet enduring memorial to a remarkable woman of Spitalfields. An interesting story of unlikely friendships. I can see how the hat would double as a Georgian cap but, as soon as I clasped eyes on it, I knew it was a C20th woman’s hat. Perhaps because I love ‘vintage’ clothes, though I rarely wear them these days. What interests me is how designers continue to pillage the past for inspiration and repackage older designe for more modern markets, as well as Denis Severs’ wonderful talent for creating the past from more recent items . His house showed me how intention can supersede authenticity in recreating important truths about the past. I had to fight back tears in the attic room In Folgate Street. One must not confuse being poor with lack of refinements and culture. What a wonderful story. I would have loved to have met this lady (Isabelle Barker) and to hear her stories of yesteryear. I have just seen this article about Isobel Barker trying to research my great great grandmother Isobel Leah Barker daughter of the mentioned Daniel Barker. My own grandmother was Leah Isobel but preferred to be called Isobel. Though my Isobel was not Jewish she converted to marry my Great great grandfather Abraham Da Costa and was married at Bevis Marks synagogue with her father Daniel as a witness.